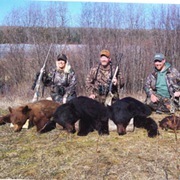 My brother and I just returned from our first bear hunt ever with W&L Guides. What a great experience! Awesome crew and awesome bears! My brother and I had been talking about going on a bear hunt together for some time. Wally Mack of W & L Guides had been recommended to me by our local Colorado SCI chapter president who has hunted with Wally in the past. So we decided to book with Wally for the 2016 Spring hunt. 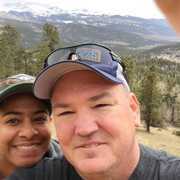 It's a 28 hour drive each way from Colorado Springs to High Level, AB Canada, but I was glad we opted for the drive the first time out as it made it much easier to pack our gear to camp and getting our trophies home a breeze. (Pro tip: Put the bears into your cooler and then have them frozen cooler and all. It makes it much simpler to fit them in that way! Bonus Tip: If you forget and you bear won't fit, go into town to the Canadian tire and buy a cheap sleeping bag. Triple bag the frozen bear, put him in the bottom of the sleeping bag, and double it back on itself. My big bear rode all the way home like this with a couple of double bagged ice bags and was still frozen solid. ) 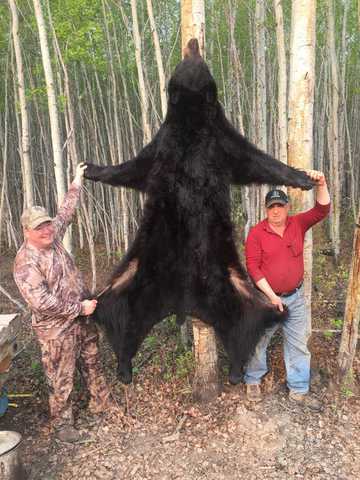 We each took nice 6'+ bears the first couple of days, so for my second bear I was determined to get a bigger one. As luck would have it this monster strolled into my stand! I knew he was big, but it wasn't until I had a look through my camera and snapped this picture that I knew just how big. Look at that head! And those tree trunk legs! He came in huffing like he owned the place (he did) and stood up on his hind legs to pull a full grown beaver carcass out of an inverted bucket about 8' in the air. He was actually able to stand on his hind legs and get his head about a third of the way into the bucket. And the sound of him just crunching that beaver up whole was pretty intimidating. Finally he gave me a good broad side shot and I put a .308 into him at about 25 yards. He bucked and then let out at a fast run. About tens seconds later I heard him crash hard and then the tell tale moan showing he was down for good. I texted my guide that I had a bear down and that it was a big one. Jim showed up about 45 minutes later to help me retrieve it. Luckily my brother had come along as well. It took us a while of tromping through through the dense brush, across a creek, and through hordes of mosquitoes, but we found him about 75 yards away. Then the fun began! It took all three of us to hoist his front end onto the quad, and then Jim held him there while my Brother Shawn and I hoisted the back end on. Then I got to watch Jim do some amazing quad maneuvering across logs, a creek, and general brush to get back to the truck. We had bungee'd the bear in place and didn't even consider taking him off the quad! (BTW, my thighs were sore for three days after power squatting that bear onto the quad!) It was almost midnight when we got back to camp. 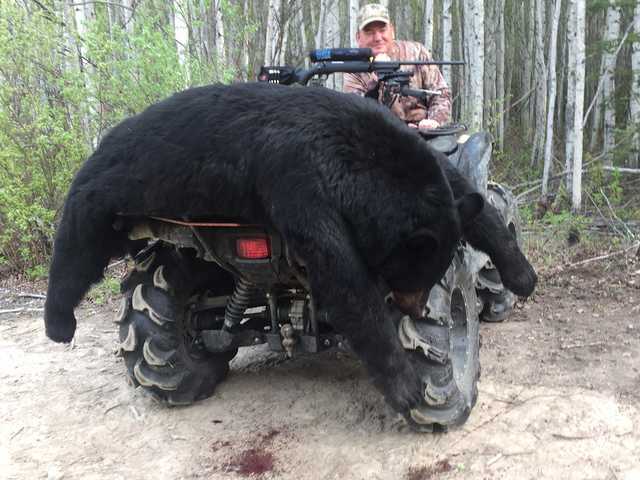 The next morning Wally's crew loaded the bear back on the quad for this picture. Again, I knew he was big, but I think this really shows just how big. That's a Yamaha 750 quad the bear is draped out on. He Skinned out at 7'5" nose to tail. (may actually be a bit bigger as the skull was left in the hide). The coat was absolutely beautiful. No rub marks and the fur was sill long with a dense wool underneath. Best guess on weight was about 400 lbs. 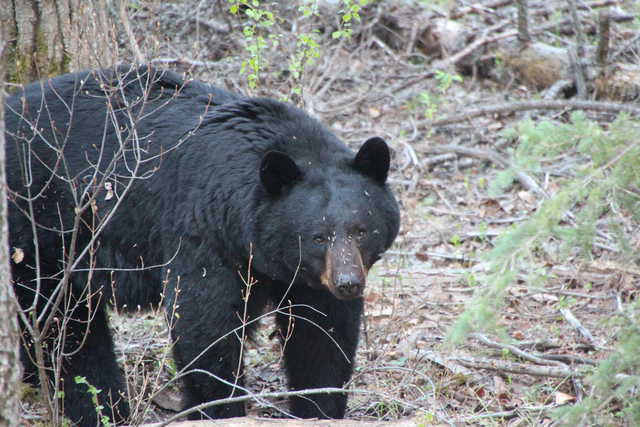 Huge for a Spring bear and if the old adage of gaining 30% over the summer before hibernation is true, he'd have been 500+ in the Fall. My Taxidermist (Mill Iron Taxidermy) has all of the bears now. My "smaller" bear (about 6' 4") will become a rug. But this monster is getting a full size mount and a place of honor in our home. I can't say enough about the folks at W&L Guides. The accommodations were quite comfortable. Three great meals every day. And Wally and the entire staff were knowledgeable, friendly and accommodating. We had such a great time in fact that we have already reserved our spots for next Spring!